The Codex Atlanticus is the world's largest collection of drawings and writings by Leonardo da Vinci and has been preserved since 1637 at the Biblioteca Ambrosiana in Milan, one of the first libraries in the world to be open to the public. 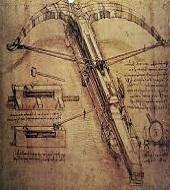 It consists of 1119 pages spanning the intellectual life of Leonardo for a period over forty years - from 1478 to 1519 - ranging among the most diverse subjects: from sketches and preparatory drawings for paintings to mathematical research, astronomy and optics, from philosophical musing to fables and recipes, up to curious and futuristic projects of inventions such as hydraulic pumps, parachutes and war machines. It was put together at the end of the sixteenth century by the sculptor Pompeo Leoni, who had managed with great difficulty to recover a part of the writings of Leonardo from the heirs of Francesco Melzi, the faithful student whose Master has entrusted his writings on his deathbed. The curious name "Atlanticus", that seems to suggest strange and mysterious content, was actually attributed for its size, in fact the sheets on which Leoni mounted Leonardo's writings were the format used at the time to create geographic atlases.